South Korean football icon Park Ji-sung has offered to resign from his post at the national football governing body, officials said Monday. Park decided to step down as the Korea Football Association (KFA)'s youth strategy department chief and the football body is currently mulling over his resignation offer, according to the KFA officials. 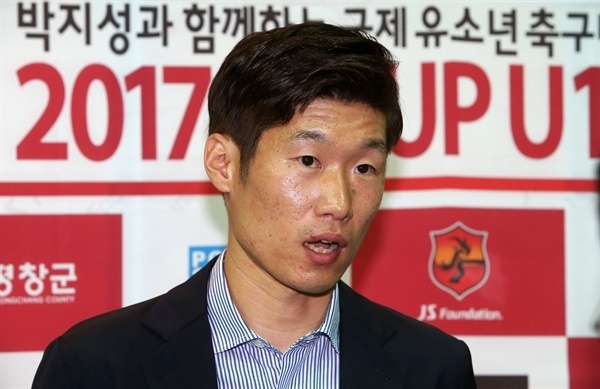 The former Manchester United midfielder took the KFA post in November 2017. It was the first time Park had taken an official position within the KFA. He vowed to develop South Korea's youth football using his abundant experience in Europe. Park has been looking to build up his post-playing career as a football administrator since he hung up his boots in 2014. He completed the FIFA Master course, a sports management program coordinated by the International Centre for Sports Studies and endorsed by FIFA, last year and engaged with various football-related organizations. Sources said Park may have difficulty focusing on his KFA role in South Korea since he has lots of overseas commitments. Park is currently a Manchester United club ambassador and is a member of the International Football Association Board's Football Advisory Panel and the Asian Football Confederation Social Responsibility Committee. The 37-year-old also runs the JS Foundation to help young footballers. Park is considered one of the best footballers South Korea has ever produced. He represented the country at three FIFA World Cups, scoring at least one goal in each. He won 100 caps for South Korea, making him one of nine South Koreans in the century club. Park, who had stints with PSV Eindhoven and Queens Park Rangers, was also the first South Korean to play in the English Premier League.